There are actually three types of sleep apnea. These are complex sleep apnea (CompSA), central sleep apnea (CSA), and obstructive sleep apnea (OSA). Below, you will find their descriptions and their list of symptoms. Out of all the three, obstructive sleep apnea symptoms affect the majority of the condition’s cases. It is the most common, compared to the other two. CSA affects a small portion of cases, and CompSA is the rarest of the three. From the information given above, you can clearly see that CSA is a neurological problem, OSA is physical, and CompSA is both. 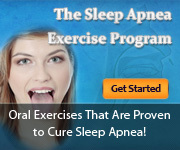 Choking and snoring are the most distinctive obstructive sleep apnea symptoms. The only way to be certain is through a polysomnography or the study of sleep. A polysomnography, through data gathering of the activities you make in sleep, is the best way to determine what kind of sleeping disorder you might have. Since OSA is the most common, and affects most people, there are common factors behind this type of sleep apnea. In any case, all of these symptoms can be an ordeal to experience. Having this sleeping condition immediately treated will be vital.